The Greater Boise Auditorium District (GBAD) is awash in cash from the local hotel room tax and Boise City’s Team Dave is trying to get their hands on it. 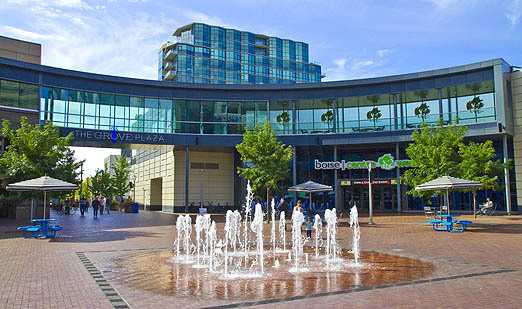 The City Council will discuss a scheme at Tuesday’s meeting that would allow them to sell the Grove Plaza and fountain for $8 to 10 million so they could spend it on a baseball park with no public scrutiny such as a bond election. The Central District urban renewal project, which includes the Grove Plaza with the fountain and donor bricks, has expired. The Capital City Development Corp. (CCDC) has owned the area for nearly 30 years and they will transfer ownership to the city. Logical move, the area is essentially a park with a fountain and an outdoor concert venue with benches, etc. No money exchanges hands and the Grove Plaza remains a public asset. But since the location is outside the front door of the Centre on The Grove convention center, it would be just as logical to transfer title to the GBAD. In fact, GBAD has had a maintenance contract for years with CCDC. When GBAD executive director Pat Rice learned of the upcoming transfer deal between CCDC and Boise City, he began the work of negotiating a new maintenance deal with the city. That has been pretty much the only official communication between GBAD and Boise over the Grove Plaza. Throughout the past year’s controversial meetings, presentations, and proposals, for a downtown ballpark,GBAD has remained silent. The board took no action regarding ANY expenditures for the proposal which would have featured a baseball park/soccer field surrounded by a private commercial development. First it was in the old K-Mart property at Americana and Shoreline, but that was abandoned for a potential location at 2900 Fairview near Whitewater Parkway which is in limbo. Citizens have been generally opposed to spending tax money that would be part of a private development. In a plan that defies logic and wreaks of “insider trading” and blatant money laundering, Team Dave’s offer will undoubtedly highlight the Tuesday council meeting. In fact, GBAD has expressed little interest in a stadium even though the agency could legally run a ball park. Meanwhile Mayor Dave Bieter has eagerly promoted and endorsed a downtown ballpark. Greenstone Properties has been the developer with the architectural drawings. Margaret Carmel at IDAHOPRESS did some good reporting, contacted city councilors and added perspective to this post. Nice photo of the plaza. Bad (financial) dealing. It is like the 4th installment of “The Godfather” movie. Who is the financial “genius” in the City of Boise? When “in a nutshell” requires four paragraphs that left me dizzy, it’s a problem. EDITOR NOTE–Sorry. It was a BIG walnut shell! 🙂 you should try to read the actual document. Too damn clever for their own good. Unbelievable. Is there anything that takes place in this City that Bieter has not managed to make twisted, shady and disgusting? Is this something that can be Appealed by concerned citizens (who have testified in opposition) if it is ok’d at the Council meeting? If that is the case, folks need to show up at the meeting, and speak out against it! EDITOR NOTE–GBAD has to agree to buy it first. Not sure if they have any interest. I knew there was some way to get a backroom deal for a new ballpark that we simply do not need, especially for a Short Season Single-A minor league franchise that only plays 2-3 months out of the year. $8-10 million can go a long way towards more important uses to better serve the common good. Thank you once again, Dave. This city administration is out of control and so outrageously greedy it defies all reason. Why do we have these shadow taxing “districts” in our city? Money just leaks from one to the next without regard for those who should have a say in how it is used…the taxpayers. I, for one, have no interest in funding a minor-league baseball stadium in Boise. Period. Isn’t there an audit of city finances that could be performed to nix the shell game they play on every hair-brained scheme?? These special district should have expiration dates. Like right now. I have come around and believe the ballpark should be put to a vote, even if it is advisory. I don’t have a problem with hotel taxes paying for it since a bond would place an annual tax on real property. A vote would require the City to gather public support as was done with the Ada County courthouse. How much is Mayor Bieter’s net worth? Somewhere in a dark, dank, smelly room (probably in City Hall) is a short demented man who reeks of car salesman, but on a scale of slimy and shady like you’ve never seen hunched over a desk and peers (leers) at a spreadsheet set before him and says: Gentlemen, and ladies, we have to protect our phony baloney jobs. Takes a swig of Boise River water from a Perrier bottle and wipes his mouth on the back of his sleeve. Secretary (whiny voice) Dave, GBAD has a pile of cash and they are just sitting on it. Mayor Dave: Is that so, I want it and I want it now. Takes another swig of River water. And that is how team Dave gets his way as Mayor. Team Dave has the Trump syndrome that anything that adds to his legacy or helps his friends is fine, regardless of what’s best for the citizens of Ada County. It’s true that everything about the current ball park is terrible except …………..its location. As Regan would say………tear down those walls……….. build a new stadium on the current site. The property is practically free and access is terrific. It would remain a benefit for all of Ada County and as the area grows it the location becomes even more accessible to all. Give it up Dave. Enough is enough. You can’t push your personal agenda onto the tax payers of Ada County through the slight of hand CCDC. If/when I run for Ada County Commissioner next round I’ll be doing everything I can to stop feeding the beast at the expense of Ada County property owners, tax payers. Since the central district urban renewal district has expired, it should mean those taxes are no longer diverted to CCDC and go to the general funds. So, citizen property owners taxes can now go down. We have subsidized this build up in downtown. Tax relief is what is needed. EDITOR NOTE–You can bet there have been discussions at City Hall on how to spend the windfall profit and not violate the 3% budget increase limit. Who paid for the original expenses before it was laundered through CCDC? Whoever that was is the rightful owner now. EDITOR NOTE–CCDC paid with diverted tax money. Boise city is the logical entity to get the expired property. We citizens own all of it!! Why no OUTRAGE! over the hidden clause in City contract documents and ‘Consent Agenda’ fraud that is going on? Where is the City Council? In Team Dave’s pocket? Where are city staff who should be INFORMING the Council members of these self-dealings? What part of “we don’t want a GD baseball park anywhere near the city limits” does the city government not understand? Do we not have enough congestion downtown and on the adjacent streets? Oh, for the “love of chest thumping” I guess. When local governments can’t do basic collaboration it’s the citizens who suffer, and Boise City seems to have this concept they only want to participate in ventures, if they can own and take credit for it. Baseball stadium is a prime example, Boise seemed to never consider the idea of supporting a district to improve the existing stadium which has better access and parking than downtown would. Simply put, the site was outside the City so it didn’t meet the basic criteria for their support. Another opportunity to collaborate on a stadium with the BSU baseball team did not happen, maybe BSU had issues with it, I don’t know, but I heard others say the City did not like the idea of a stadium on BSU land, because again the City might not have the control their ego required. So the result may well be one government agency has an unused baseball stadium, another government entity will build a stadium for the college team, and a third government entity will build a stadium because they have to own it and couldn’t get a deal done with others. Unfortunately this same pattern continues with the Fire Training Facility, Composting (which the County landfills turn into natural gas), control of roads, etc. Boise does not play well with others, tax payers are paying for it. As an aside, the only hotel rooms to be sold for a minor league baseball game will be the traveling team. Its a joke to think our minor league team will be a boon for the GBAD coffers or local economy. The real travesty here was vacating the public right of way that was the relevant parts of 8th Street and Grove Street. I suppose all of you have forgotten those streets used to be continuous. BG, do you know if the Grove’s RoW was vacated before ACHD or after? I know everyone hates a streetcar but a Grove St/Bannock St loop through downtown would have been perfect. Now Grove is forever ruined as a transportation corridor. And it barely functions as Plaza, most of time much of the year it’s utterly vacant. And the way other streets are being whittled down it won’t be long before all of downtown is a pedestrian mall. But have hope, concrete lovers, all of Julia Davis Park and the Greenbelt will soon be concreted over with memorials, monuments, zoos and museums. “John Brunelle, CCDC’s executive director, said the intent for the stipulation was that the proceeds from a possible sale of the plaza, which was constructed with public dollars through tax-increment financing, would be required to go toward a public amenity.” Our elected public servants ALWAYS stress safety. The Protect Boise campaign of the Boise Fire Bond of 2014. Boosted no tax increase. Now we come to find out that our public servants made a $17 million plus dollar mistake? But according to elected public servants they learned something! Maybe our public servants should take off their lobbyist’s hats for out of state developers, put on their public servant hats and use the public’s dollars to pay for the erroneous mistake made by our elected public servants on the fire bond. NO INCREASED TAXES was what the public voted for! As safety is an amenity!? Cynic, ACHD dates to the early 70s. Stick49: I’m aware ACHD was created in 1972. The question was when was the RoW for The Grove vacated? It may have been before 1972 because The Grove was part of the failed BRA and its goal to create a downtown mall. How is this relevant? So we don’t repeat the mistakes of the past. I don’t have time to provide back-up but pedestrian malls have been a failure nearly everywhere they’ve been implemented. Look at the lost RoW downtown with useless bike lanes and the contra flow bus lane on Capitol. And the cars keep coming.